2. Heat the pan and melt the butter and oil. Add the veges and cook until softened. Add the mince in batches and brown breaking up the lumps. Sneak in the anchovies and break up. They will dissolve. Mix in the cooking sauce, herbs and season to your liking. Cook simmering for about 20 to 30minutes and then set aside off the heat. 3. To Make the Sauce: Melt the butter in a pan over a low heat until foaming. Add the flour and stir constantly for 2 minutes. Remove the pan from the heat and gradually stir in the milk. Return to the heat and bring to the boil stirring (use a whisk) constantly until it is thick enough that when you stir it you can see the bottom of the pan. Season well with nutmeg, salt and pepper. 4. Brush a dish with oil and spread a thin layer of the meat mix, then a thin layer of sauce and then cover with the lasagne sheets. Repeat a couple of times. 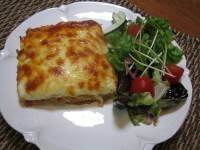 Continue the layers finishing with lasagne sheets topped only with sauce and the cheese. 5. Bake for about 35-40mins or until golden brown on top.